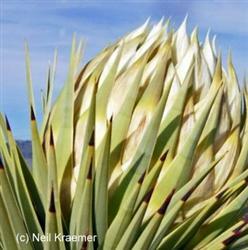 The Joshua Tree Yucca is a tall, tree like plant that is native to the Mojave Desert Region. It grows fast and tall for desert plants, with a root bsystem that can reach up to 1 meters away. The leaves are dark-green, growing to sharp points at maturity. The flowers emerge in February to late April, in large panicles that are white in color. The bark is light brown, with fiborous wood.